Teeth out, a photo by PhylB on Flickr. Marcel has spent the last three years attending the orthodontist because his mouth had been too small to contain any more than 24 adult teeth. 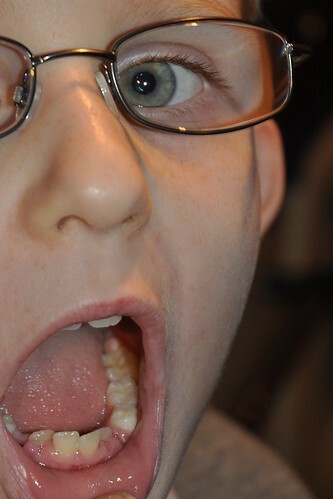 It was quite soul destroying to nag him for twelve years about good tooth hygiene only to see him have his perfectly healthy adult teeth extracted because of space. Fast forward to last year and Lots, who has a big mouth (literally more than metaphorically!) found out at a routine x-ray that she was missing the adult teeth under the very four teeth that Marcel had had to have removed at twelve. How ironic is that? Fast forward to last month and Léon's adult lateral incisors came through, but because his milk canines were too big he had no space for them so they were pushed back behind the canines and were starting to cause him to speak funny. Remembering from the others that the canines didn't fall out naturally for another five or so years, I dragged him across the road to the dentist for a second opinion. He said they absolutely needed to come out as soon as possible and gave me the option of next week or on the spot! I couldn't see any point in waiting and giving him a week to worry so we went for on the spot. He was so brave... a tiny whimper at the three jags and a squeeze of my hand and then finally the beautiful, perfect canines were tugged out without a tear. He's such a mature wee guy, I'm so proud of him. New glasses, a photo by PhylB on Flickr. 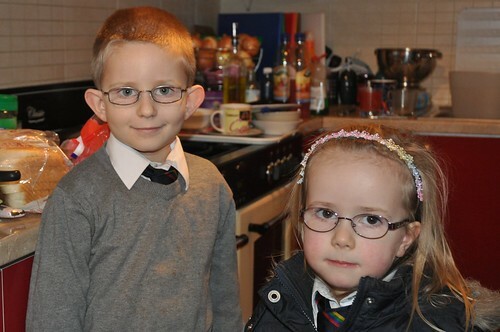 Léon now has his new glasses too and they don't seem to be overly reflective either - I am such a happy bunny! Into the bargain, for the first time in three years neither of their prescriptions had changed so I didn't even need to buy that obligatory spare pair you need for when they snap off a leg or lose a screw. I can use their old ones as spares. Excellent news for my bank book! Anna had been asked by her teacher to write 'a couple of lines' about a place she goes that is special, suggesting a relative's house or holiday destination might be a good option. (The poor teacher is going to need to ask for overtime given how carried away she got!) Anyway, she only had to ask for help with a few words, managing to sound out much of the spelling herself. Her biggest problem, because it was not phonetically English, was the word 'pizza'. She knew it was an 'i' and not the expected 'ee' and she must have remembered the double consonant in the middle, but somehow she remembered it as a double 's' and worse still she was concentrating so much on the 'zz' sound, she managed to forget the 'a' altogether, so when I proofread it for handing in, she's actually written 'We make piss and we eat piss!' I guess you must get the odd laugh when you are teaching five year olds! Anyway, all in all I was quite proud of her wee story. It isn't bad for someone who only started school in August. Burns supper, a photo by PhylB on Flickr. 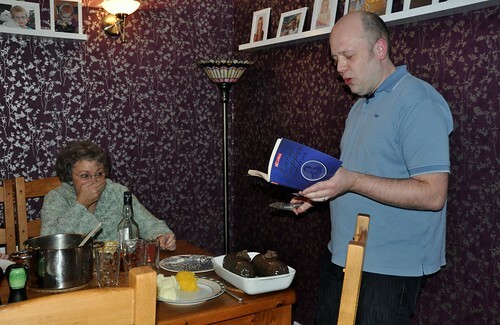 We held our own wee Burns Supper last Friday and mum joined us. I think if we redo one next year I will film Thomas reading the address to the haggis - for some reason she seemed to find Thomas's version of Scots rather amusing! There's nothing I can add to this testimony, except to say how moved my oldest two kids were watching this dignified, elderly woman. 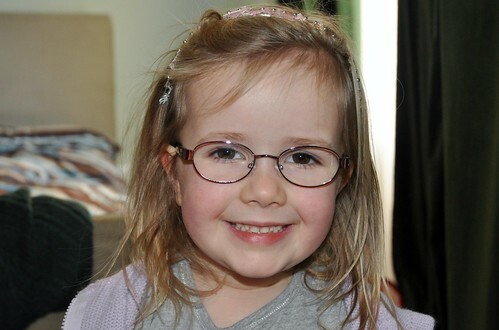 Anna's new glasses, a photo by PhylB on Flickr. 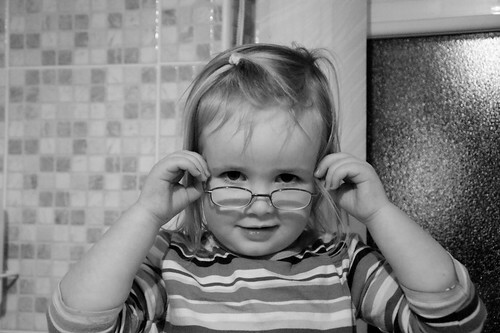 When Anna got her first glasses the week before she turned four, I wasn't overly pleased with the selection available. They had a few models that fitted babies and a few for school age kids but not much in between, so we ended up with the only ones on offer in Boots. I had learned from Léon's glasses the previous year that you go for the optician nearest to your local supermarket because you want to be able to take them in for repairs on your daily trip, not somewhere in town where you only go on weekends! So for us that meant Boots. They came with thick lenses and no anti-glare coating and the were the bane of my photographic life for the last year. 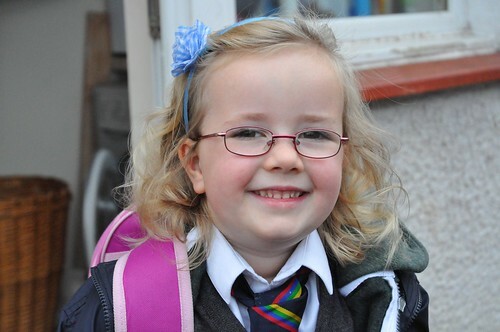 Now she's five however, they have a better selection and thin, anti-glare lenses have been added as standard. I am much happier with her new ones already. Not only does she think they are prettier, but I can actually see her eyes through them. Yippee! I can definitely see more of my little girl today, than I could back in September. As a child I was quite reticent. The thought of having even one line in a school play in primary school would have given me many sleepless nights. Still fairly introvert as an adult, I have learned how to stand up and speak to an audience. I've have given the odd talk and lecture in my time, in English and French but I have to admit I am secretly still happier working quietly in my office with my books. I'm so proud of my wee p1! Although it is lovely to have family abroad because it gives you an excuse for foreign holidays and lovely reunions, you do feel the odd pang of sadness at what the kids miss out on. 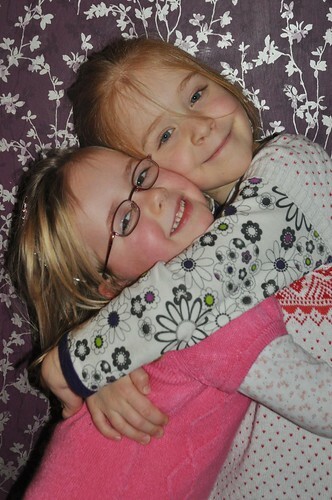 These two girls, had they lived in the same city, would probably have spent a lot time playing together - they are just a year apart in age, and yet because they live in Glasgow and Copenhagen, are lucky if they meet up once every eighteen months. At least they can communicate. It would be awful if Anna hadn't learned Danish too and they'd had to wait till Ursula learned English at school. And the same is true for Ursula and Léon, who got on like a house on fire despite not having seen each other since September 2011. It was lovely to sitting and listen to them chatting away happily in Danish, laughing and hatching little plots together. Léon's been singing this non-stop all week. It is strange to hear him use Scots because he isn't really all that familiar with it. In fact Danish is much more comprehensible to him than this little song, that I had to explain in places! I've always found it quite amusing to hear my kids' mistakes when they try using real Scots words. 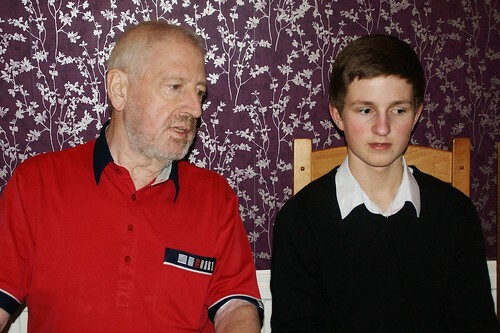 I grew up with grandparents who spoke nothing else so knew exactly how is should be pronounced even if I spoke standard, boring Newton Mearns English myself, but my kids haven't heard much real Scots themselves so happily sing 'bread' in the middle of a sentence containing the word 'jeely'. Many words I understood passively as a child are more foreign to my kids than the Danish, French, German and Spanish they hear around their own dining room table. Things have changed quite a lot in the last generation. Léon's name isn't actually Léon... Technically, his real name is Léon-Olivier but that is a bit hard for his Scottish compatriots, so he gets called Léon (which in itself is hard enough as we pronounce it the French way, not the English way). Anyway, people have often remarked that we chose to shorten it to the wrong half, given his nature. You see, Léon is a very soft and gentle little boy, and is not at all lion-like. He also has a very conciliatory nature - quite olive-branchy! However, I think in the last few weeks he's grown into his name! His mane has taken over! He's been badly in need of a haircut but I kept thinking it was a bit mean to have all that cut off in this cold weather. I've known since he was a baby that he has extremely thick hair. Once, at the hairdresser in town, when he was just one, the woman who was cutting his hair remarked to me that she'd been cutting hair for thirty years and had never cut a baby before whose hair felt like a grown man's! Anyway, tonight when he spiked it up using little more than his sticky hands, I decided enough was enough - he's just going to have to wear a hat to keep warm because like that he actually looks like he's wearing a fancy dress costume! Sadly, I do think that however long the fashion gets, poor Léon is never going to be able to opt for anything other than a short back and sides because it just becomes way too overstated and unwieldy when it gets any longer. 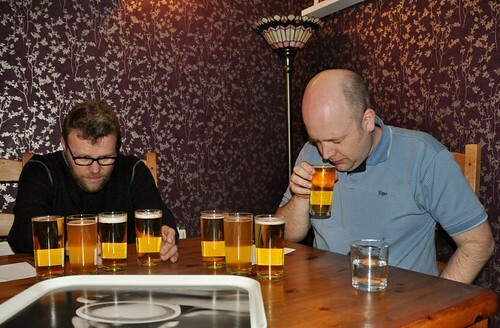 Thomas and Bjørn's beer tasting competition, a photo by PhylB on Flickr. Onesie fun, a photo by PhylB on Flickr. 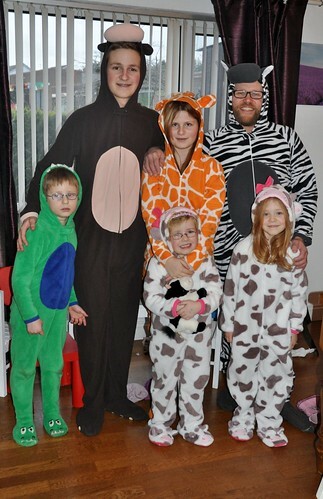 We decided to create a wee onesie zoo here at the weekend. Having bought some of them in Primark over Xmas, we decided that was the obvious place to get one for those members of the family who had not yet succumbed to losing their dignity in favour of warmth and comfort. So over we went to Braehead, driving through the snow and walked in the the ladies' department to find they'd got rid of their fleece onesies and replaced them with bikinis and beachwear. What is it with these big chain stores? How often are they so busy rushing ahead to the next season that they miss all the money they could be making now? I cannot believe that with outdoor temperatures on the minus scale and no holidays imminent, they would have had a rush on bikinis, and they missed out on selling Miriam and I something ridiculous and fleecy on Sunday... I guess it is a bit like my rant back last Halloween. 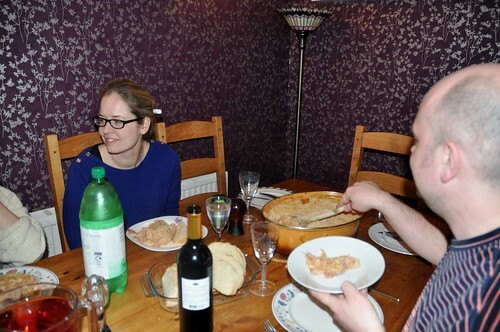 Cassoulet, a photo by PhylB on Flickr. My sister-in-law, Miriam, is (of course) Danish. I was recounting to my mother yesterday how one of Miriam's culinary specialties is 'mousse'. She makes wonderful mousse. Previously, I had tasted her lemon mousse, and on this weekend's visit, she made blood orange mousse. Anyway, I was simply raving to mum about her 'mousse recipe' but we spent half the conversation talking at cross purposes because she had assumed, given the Scandinavian connection that I meant 'moose recipes!' I think it was only when I got to 'blood orange' that the penny dropped! Having fallen in love with this video over Xmas, Léon bounced outside last night and made his own little Snow dog (which was quite a feat with less than one millimetre of snow!) He then proceeded to score the 'real pet owl' off of his birthday list (no idea why he's already written that with nearly nine months to go), citing the fact that his snow dog would come to life on the stroke of midnight and he wouldn't need two pets! The poor wee man is just desperate for a pet. Anna is a strange one. She's a complete goody two shoes, teacher's pet type. She wouldn't dream of doing anything naughty and is very mature in her outlook, often tidying up behind her older siblings in a parental fashion. She has one little failing though, and it's one none of the others has ever even tried out. She is a graffiti artist. The Welsh dresser, the door frame, the bookshelf, the wall on the staircase and today the hall window ledge have all been graffiti-ed by her at some point over the last two years. Up till now, she has always been found out. Her drawings of people are instantly recognizable, her hand-writing quite distinctive with curly 'n's and angular 'l's, and to make things even easier, she signs her work 'Anna', probably because she's so proud she can write, she forgets she's not allowed to! When pulled up for it, she always looks almost suicidal and immediately admits she got carried away and forgot where she was allowed to write. I think she subconsciously thinks that as long as she produces something beautiful, I will forgive her for it being on my furniture! I'm sure we'll have a lull for a few months now she's had another serious talking to, but I doubt Picasso has produced her last work of art! After all the talk about HMV yesterday, it got me to thinking about my gran. She had two main jobs that I remember from my childhood - she was a pianist - she played in a club on a Saturday night and she worked in a record shop (the record department in Lewis's department store on Argyle street). By the time I was around, she simply worked behind the counter so I wasn't really aware why she worked in a record shop, given she was a 'granny'! One night when I was a teenager, after she'd retired, I asked her how she'd come to work in a shop where most of the staff were teenagers. She explained a world to me that I knew nothing of... Before rock'n'roll, before pop and the likes people went to music shops, as they were then, to buy sheet music, and to help those buying the music, they needed a resident musician who could take the customer into a booth and play it for them to help them decide which piece to buy. In an age where we listen to snippets of music online and then download tracks through cyberspace, you have to say we've come a long way from my granny (born in 1916) sitting playing sheet music to potential music customers in the 40s and 50s! 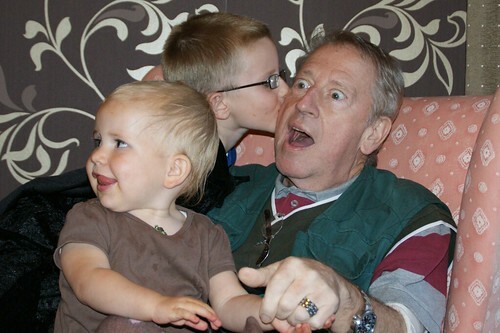 Dad and the little ones, a photo by PhylB on Flickr. I had feared for about a year that Amaia would set another first in the family - the first to reach the age for state nursery before growing enough hair to go! And it seems today that she has achieved that goal! Anyway, she may not have been able to wear any bobbles on her first day but she was absolutely thrilled to be allowed to go out with her siblings at 8-45 wearing her own little (recycled from Charlotte, Léon and Anna) uniform jumper! 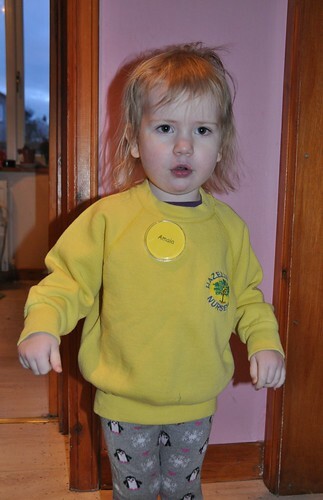 She refused to zip up her jacket despite the sub-zero start so everyone would see her jumper and badge on the school drop-off. And Anna and Léon showed her off on the way in to school almost like proud parents! She was happy to be left alone for the settling-in hour doing jigsaws, weighing fruit and happily sitting with her teacher who'd come to our house last week to meet her. 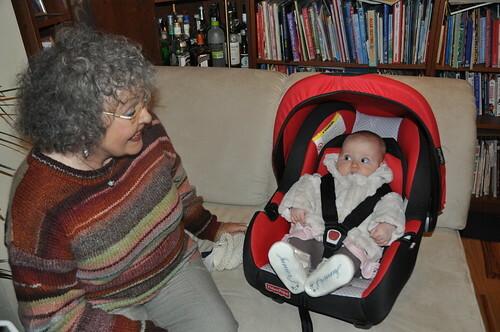 Having met her in her home surroundings, Amaia immediately clocked her teacher (who we knew well as she'd been Lots' teacher nine years ago) and felt safe to go to her. The home visits are definitely a positive innovation. When it came time to leave, she was full of smiles. Tomorrow she's back for a couple of hours and I'm sure by Thursday, she'll be ready to start her full sessions. Amaia got Play Doh for her birthday. Playing with it with the girls reminded me of Derek's Fuzzy Pumper Barber Set. He got it for Xmas or a birthday when he was six or seven, so I would have been pushing ten and trying to play cool. Play Doh was for kids! But to be honest, I was desperate for a Fuzzy Pumper of my own! In fact, if truth be told, I wouldn't say no to one even now! Anyway, I think I simply opted to casually help him play, much in the same way Charlotte has been helping Amaia play for three days now! Amaia's birthday breakfast, a photo by PhylB on Flickr. Three years ago today I learned I was able to give birth to a baby who was just shy of ten pounds, drugfree and without any help (and still walk afterwards!) That's great for the self esteem - but I blogged it at the time, so I won't go there. I still don't know why she was two pounds heavier than my boys and two and a half heavier than my other girls. Now she's just a dainty, dinky little thing. Maybe it happened to show me what I was capable of! In any case, she's a delight. She's shy, and yet funny, a real actress. She feels safe and happy surrounded by her huge network of siblings. This tends to manifest itself in the way she assigns names to everything - show her five kittens, she names them Marcel. 'Yotsie', Léon, Anna and 'Maia', the same if you give her five teddies - I know most kids do this, but she takes it to extremes - five peas on her plate will also be assigned the same names, as will her fingers, the stars in the sky and the flowers in a vase. She loves the security of her family. She's a gentle soul, a bright and cuddly girl. She loves to do funny voices and make dramatic faces. Her hugs are so tight. I can't imagine if we'd stopped before her. She lights up my life every day I wake up. Deep down there is a slight sadness knowing that when you are nearly 42 when you have a child, you will spend less time with that child than with the one you had at thirty, so I will compensate her with extra hugs and hope that those will someday make up the deficit. How about this for spooky? Marcel's been doing a paper round for two years. It takes in six streets around Crookfur. While he was out last night his boss phoned and asked if I thought he'd be willing to increase his round by a few more streets. I figured it'd be ok, but agreed to send him over today to find out the details. In he went, and Martin came out with It isn't much of an increase - I just wondered if you could add on Douglas Court and Buchanan Drive? If I was in any way superstitious, I'd probably take that as some sort of supernatural contact. 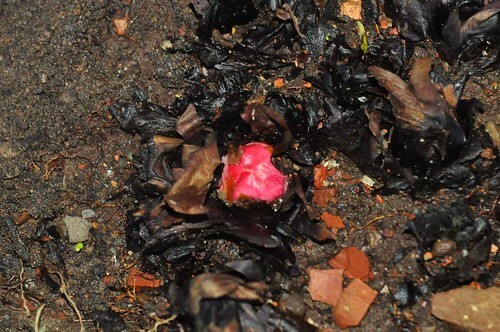 Rhubarb on Jan 4th!, a photo by PhylB on Flickr. 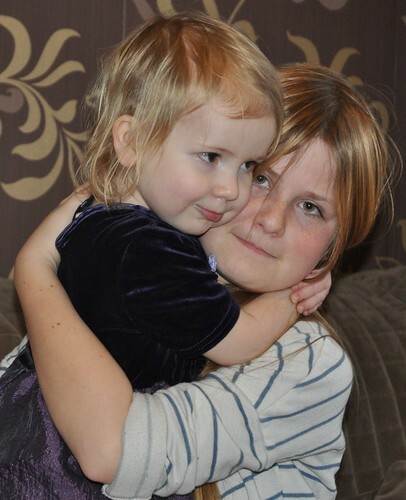 Birthday hugs for Charlotte, a photo by PhylB on Flickr. And so the second of my children becomes a teenager. I know I've been calling her a teenager for about 18 months, or more precisely since she started staying in bed till after midday on weekends and holidays, but now it's official! I wonder what sort of teenager she'll be? She's a good girl, a conscientious worker at school. She has been through much more than many kids her age, though today isn't the day to go into that again. She is growing up in a less than conventional home, with a multicultural richness that inspires her with its mixed traditions, even if she is a little overwhelmed at times by the number of languages thrown at her annually! She loves her younger siblings with an unimaginable depth which shows her caring side and although her own youthful awkwardness brings a reticence that is at times in stark contrast with her older brother's extrovert personality, I am sure she will mature into someone with self confidence and a caring nature that I will always be proud to call my daughter. 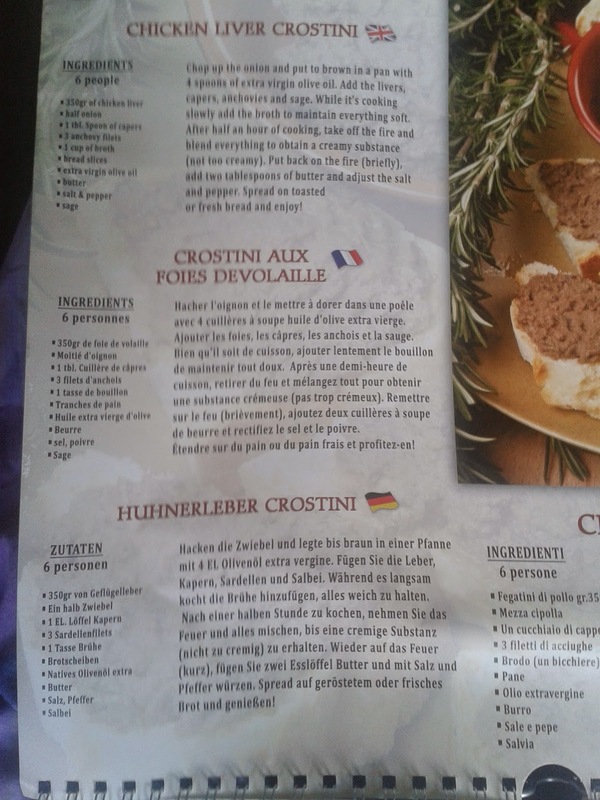 My new Tuscan recipe calendar - a linguistic catastrophe! Let's start with the French. The French is bad, really quite bad. If you speak French, read it and laugh! We are first confronted by infinitives instead of imperatives, use one or the other but don't mix them. However we get the gist. The word for sage seems to change between the (not-very-idiomatic) list of ingredients and the actual text (the text is correct). Where it ever got the idea that bien que has anything to do with 'while' in the sense of time is mind-boggling... 'De maintenir tout doux' - very literal and totally nonsensical! Finally they get into imperative mode by the middle but it is beautifully juxtaposed with another infinitive... 'retirer du feu et mélangez'. Une substance crémeuse/crémeux - give me strength - adjectives have to agree every time they occur in a sentence not just the first time... But my favourite line is at the end. 'Étendre sur du pain ou du pain frais et profitez-en!' Hahaha - I am already imagining myself in a restaurant being asked 'Vous voulez du pain ou du pain frais, madame?' Once you've got your breath back from that, let's look at the German. The German is beyond laughable. It makes me want to cry. I don't know where to start with it - it goes off the rails at the first word, and by the second verb has jumped person. And there's a wee bit of Italian left over in vergine! By the second sentence the phrasal verb has lost some bits, and the choice of verb leaves a lot to be desired! What happened to German word order in the next line is beyond me but the meaning leaves a lot to be desired too. In the next sentence I am hoping you don't burn your hands too badly while you are mixing it with the 'fire'! Grammatically the next bit is completely meaningless. I'm crying already... The following clause has no verb at all - I guess that is one way to make sure you don't get the verb wrong! But I think the crescendo has to be the use of Spread - you know that great thing machine translation does when it doesn't know a word - it leaves the original! And of course who can fail to appreciate the beautiful mismatch of geröstetem and frisches?! Even the list of ingredients in each language is wrong! I suppose we are lucky to speak all the languages used - that way between them we might manage to cobble together a version that works! But on a more positive note, maybe I'll go and check if the calendar has a publishing house printed on the back and I will send in my business card (and Thomas's given his Spanish is better than mine) and offer our services before this year's print run! 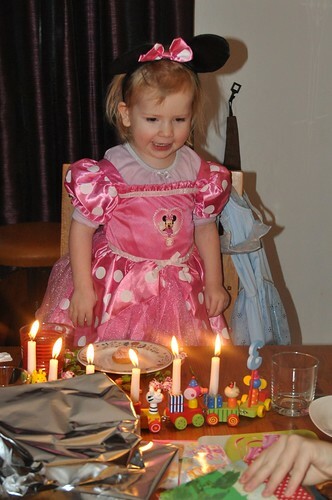 When Anna was little she had a pink dressing-up dress. Amaia has just grown into it but it is now old, worn and mangy and quite horrible to look at. Amaia loves it and has wanted to wear it over her clothes for the entire holiday. Frustrated (being the family photographer), I have been less than amused every time she covers her pretty clothes in this old rag and refuses to remove it for my camera. So I have more than once found myself muttering 'Do you have to wear that scabby dress all the time?' or 'Not that scabby dress again?' etc. I started to get pangs of guilt the other morning when she woke me up with 'Mummy, have you seen my scabby dress anywhere?' and these were more than compounded today when I heard her tell Lots 'scabby means beautiful' so I have, through gritted teeth, resolved to call it her 'pretty' dress all week, and am considering buying her a new similar one for her third birthday next week. If it's going to have to be in my photos, I'd rather it was clean, and not frayed! 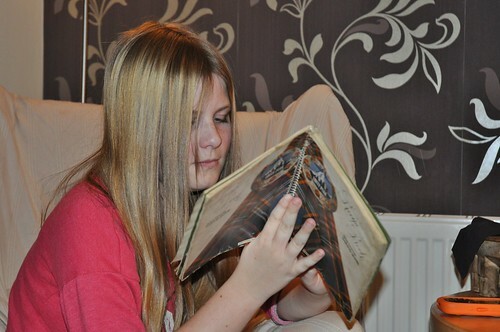 Charlotte reading shortbread recipes, a photo by PhylB on Flickr. Traditionally I spent New Year at my grandmother's house, well until she died when I was 16. As I have mentioned before there was a pretty tight programme. This year we were home with the kids for New Year so we suggested Charlotte take over my role of making the Lofty Peak shortbread. I got out my Granny's (her great grandmother's) old book. First, I was asked what an 'ib' was. It turned out to be a 'lb', but in an indistinguishable font! The next challenge was the lack of celsius. 'How do you make the cooker F or Regulo?' she asked, somewhat perplexed! She was also flummoxed by their use of the word 'amalgamate' rather than 'mix' in every other line. It is hard to believe that was ever an easier verb to understand! It is amazing how a book that would have been completely standard fifty years ago almost needs a glossary for today's kids. I must keep it for the next generation, as a little test of language evolution. I forgot to blog it on the night but given how sweet it was I want to capture it here for posterity! We do Xmas the European way. My first years as a mother were spent in France and latterly, being married to a son of the manse (however unreligious he turned out!) it just seemed normal to carry on that tradition. Introducing Santa and Xmas morning presents to kids who were six or eight when Thomas and I got together would have been a bit odd. So in our house the presents are unwrapped on Xmas Eve after dinner. They are given by mummy, daddy and the rest of the family so there are no great 6am wake-ups in this house, just calm present-giving. I can definitely recommend it as a way to go when you have kids after 40 and can't face the early morning hysteria! They also know not to expect gifts beyond our means and appreciate our part in it which is lovely. 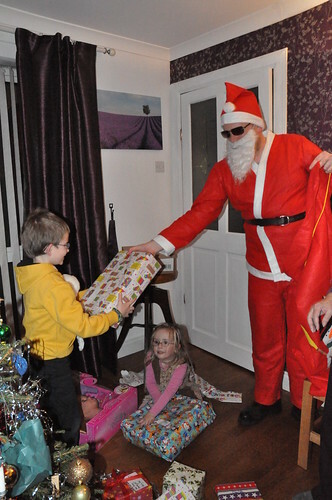 Anyway in Europe, although Santa doesn't bring all the presents, he has been introduced occasionally to drop by after dinner with a present for each kid. Thomas decided (when he found a Santa suit reduced to a fiver) that it might be fun for Santa to drop by this year for the first time ever. He borrowed an old pair of sun glasses so as to disguise himself better. He rang the doorbell after dinner. Marcel and Charlotte played along. Anna and Léon looked vaguely puzzled muttered that he sounded a bit like daddy, mentioning how odd it was that Santa spoke Danish! Amaia on the other hand was completely taken in by it. She looked utterly terrified and squirmed on the spot, her whole body language screaming at 'scary Santa' to get lost! She was not at all a happy bunny. She couldn't wait to get rid of him! Sweet. I wonder if kids ever really like Santa? I remember when my friend's husband dressed up as Santa for Marcel and Charlotte when they were little Charlotte was even less impressed than Amaia! I was watching this clip of Billy Connolly talking about his new film and his question about one's age seemed rather pertinent. He's 70 as far as I know but says he's mentally 37. I decided to revisit that very question. What age am I? Yes, technically I am 44, but what age am I mentally? If you'd asked me fifteen years ago I'd probably have said something like 23. I felt 23 was old enough to be an adult but young enough to be full of life and be fun. Of course, with the wisdom of middle age comes a knowledge that although I got married first time round at 23, I was little more than a child who shouldn't even have been contemplating settling down. So I'm definitely not 23. I have far too much life experience to be 23! Then I remembered a passage I read, interestingly, at 23 in Marcel Pagnol's autobiographical story 'La Gloire de mon Père'. I haven't looked at it in more than twenty years but I remembered it almost verbatim. I know this is quoted from the child's perspective, but if altered slightly, it rings true... Mon âge, c'était le sien, parce que mon fils, c'était moi... nous étions nés le même jour. Realistically a new me was born on 27-7-97. That is the cut-off between my life before I was someone's mother, and after. And after, nothing was ever the same again. The centre of my universe altered forever. So in a way I too was born on 27-7-97. I was born at the age of 29, if that makes any sense. I have a lot more life experience and baggage than I did at 29, of course, but essentially I think I feel 29 inside. I couldn't feel any younger because before 29, the me who I am today did not exist, but I think I'll try to stay 29, mentally, even if everything on the outside is heading further south. I wonder what age my friends and family members are?